Srinagar: A group of 25 Kashmiri pilgrims were hounded and harassed by the Pandits in Jammu, besides being disallowed to leave from a place provided to them by a Pandit family till few Kashmir police officials intervened. 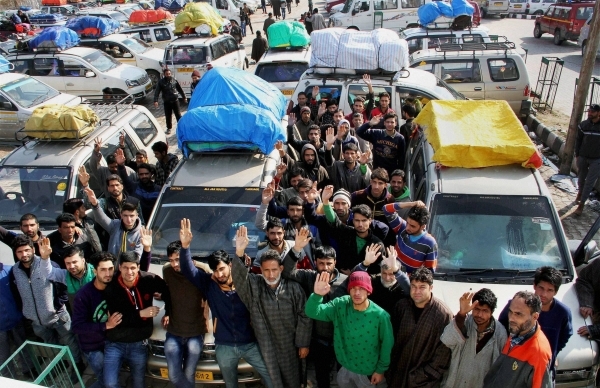 “We were group of 25 Kashmiri pilgrims from Pulwama and Budgam who have gone on a religious trip to Agra,” Habibullah, one of the pilgrim, told The Kashmir Press. “On return, we halted at the place of a Pandit friend since the situation got suddenly worsened in Jammu. It was not his house, but he lives there on a rent. Also, he was not present there except his wife”. Recounting the incident, he said they took shelter at Sector 2 of Durganagar area of Jammu when the communal tension rose. “When we stayed there, we were shocked when we saw that our own Kashmiri Pandits started hurling abuses on us,” Habbibullah, a resident of Gadoora said. “The Pandits including men and women mobbed around the house where we were staying. Then they started harassing us. They did not allow us to leave. We got frozen then and there. They even harassed and hurled verbal abuses on the Pandit woman. They were screaming at her as to what Kashmiris were doing at their rental house. They would tell her why they brought Kashmiris in their house”. All along, they would shout anti-Pakistan and anti-Kashmir slogans, accusing Kashmiris of being anti-national. On February 14, a suicide bomber rammed his explosive laden car against a CRPF busy, part of a convoy, which led to the killing of 49 CRPF men. Following the incident, communal tensions flared in Jammu when right wing Hindu affiliated groups started attacking Jammu Muslims and Kashmiris and their property. The pilgrims said the same situation continued for two days. “It was a scary experience. We could hear the mob shouting that Kashmiris are there in the house. We did not leave the house fearing for our lives,” Habbibullah said. “Later we called the administration to rescue us from that place”. A Kashmiri man, who lives in Jammu, and was part of a team which rescued the pilgrims, said that the Pandits in the locality wanted to create a scene by putting the Kashmiri pilgrims in a hostage like situation. “The pilgrims called us on Sunday. They were crying on phone saying that someone should come and save them. The first thing we did was that we called the local police officer. But, the officer plainly refused to accompany us citing the said area did not came under their jurisdiction. Then I along with some other people left to rescue them. I also took along some Kashmiri police officers who brought along their official vehicles,” he said. “When we entered the locality, the mob was still there. They called the Kashmiri pilgrims as traitors and told them why they brought the police”. They were screaming in Kashmiri, yeman karew kanie kanie (stone them). “Later we managed to get a pick-up truck and rescued them to safety,” the man said, adding, “But before doing that we have to raise anti-Kashmir slogans”. One Response to "Pandits harassed us in Jammu, harassed the Pandit family which gave us shelter: hounded Kashmiri pilgrims"
From ramban onward kashmiris r traitors without any guilt.